Pictures of some of my freebies are in the slideshow above. It’s always fun to get free and almost free products in the mail! If you’re anything like you love freebies, giveaways, rebates and money back offers! I think I’m the queen of saving! Well, today I finally got around to putting together a list for you. PinchMe – Has free samples that are released each week. Claim your free samples and see if you qualify. If you do, you’ll get some free stuff arriving at your door shortly after. Smiley 360 – Releases new Missions all the time. Find a Mission ( a product you’d like to try) and complete the survey associated with the product. If you meet what they’re looking for you’ll get some free samples sent to your door. Influenster – Sign up and start to share your opinion on products you’ve used. As you share your opinion, your influence score will rise. Each month Influenster sends out what they call a Vox Box. There’s no guarantee, but you may end up getting one of those boxes filled with free products to try! Daily Goodie Box – It’s more than just a free sample! They will send you a box of free goodies and all you do is let them know what you think! Shipping is always free and no credit card is ever required EVER! It takes a long time to get approved for a box of their freebies because the site is still new and they are trying to catch up with all the request but I can tell you I got one in the mail and its full size products! Even if it takes a while to get, may as well put your name in the hat now! Sample Source – “Try Before you Buy” and make a smart shopping decision! Is their motto! Get free samples of makeup, beauty care, household cleaning, even food and snacks! This site only sends out samples once a month so it’s best to sign up with them now so when sample day comes you’ll get a box of freebies in the mail. Just sign up and fill out your profile then watch your email for the notice that it’s sample day. ChatterBox – A sample box sent out by another site on this list called HouseParty, similar to Influester where there’s no guarantee of ever getting products, but if you do you’ll get a box of samples and products to try for free. HouseParty – Sign up and share your opinion on products. Host a “House Party” and they’ll provide you and all of your guests with free products to try out. Swaggable – Claim products that you’d like to test by adding them to your want list. If you seem like a good fit, you’ll get free samples in the mail. In exchange, leave a detailed review of the product to continue to receive more free products. Exactly Box – Every season, you’ll receive a box of 5 – 7 samples from a variety of brands. They want to get your feedback about their products so they can improve them in the future. It’s similar to what PINCHme and Daily Goodie Box offer. BzzAgent – Apply to what they call campaigns by taking a short survey. If you qualify, you’ll get some free products sent directly to you. In exchange, you’ll need to share your honest opinion of the products on social media. Ibotta – This is by far my favorite and has been around a while now. If your not already an Ibotta member I highly recommend you download their app onto your smartphone and sign up. You actually get money back on groceries that you more than likely have in your shopping cart any way! I’ve actually collected a few hundred dollars back over the last 2 or so years by using this app. You just use your phone to scan the bar code of the product and snap a picture of your grocery receipt. Super simple!!! Use code: Code: Zbqbbi to collect $10 free just for joining and opening a new account. Checkout51 – Extremely similar to Ibotta . Just download the app from the app store and sign up for an account. They send you real money back! ShopKick – this one is really neat! I use it a LOT! Basically, when you walk into a store that’s part of the ShopKick program you get points just for opening the app and walking in the front door! When I walk into target I open the app because most of the time they offer points just for walking in! So simply walk into stores, scan items and buy everyday products to earn reward points that they call “kicks” then redeem your points (kicks) for actual real gift cards! I like to cash my points in for T.J. Max gift cards. GoodRX – Now speaking of apps.. This one doesn’t exactly give you money back but that depends on how you look at it. I still think it’s worth mentioning!!! The GoodRX app is so downright cool because you can enter the prescription medication and dose you have a prescription for and it actually tells you the price at all your local pharmacies! Why is this information so cool? Well, here is an example. I was picking up a script and standing in line at CVS. I pulled out my phone and searched on the GoodRX app to find out the prescription I was picking up was actually $100 LESS across the street!! That’s a huge savings! Ebates – I know this one has been around for years but I just started using it not too long ago. It was so published on T.V. commercials that I actually didn’t try it for the longest time. Well, I’m here to tell you this site really does what it says! I’ve gotten several rebate checks in the mail from eBates. All you do is sign up for an account and whenever you plan to make an online purchase just log into your account search the store and click through from the eBates site then shop as normal. They also have a browser extension you can download to make it even easier. These sites are bit different than the ones listed above. You probably won’t get many completely free products to try, but you can get a huge discount on tons of Amazon Products in exchange for a review and feedback as well as some non-Amazon products. SnagShout – Again most products fall into the electronic accessories category. Limit of 1 item out at a time until you finish your review. Most products are $1-$2. Giveaway Services – Has a wide variety of products, but works a bit different than the other sites. Not only can you leave Amazon reviews, but you can get bigger discounts for social media shout outs, blog posts (reviews), and YouTube reviews. Extreme Rebates – Here you can score lots of free products. All they ask is that you post a review. You can get anything from a tutu for your little girl to electronics! They also have beauty products, jewelry, etc. As I think of more I’ll update this page and list it here! *Heads up* SampleSource is about to post their Spring Sample Boxes! Heads up! Spring SampleSource Boxes Are Coming Out Soon! Spring samples are just around the corner! So be sure to watch your inbox for your email invite! If you’re not already signed up for SampleSource hurry and visit their site to create a profile so you get your box of freebies too! When you get your email from them to claim your box of freebies make sure that you hurry and log into the site to claim your free samples because they go really fast! There are LOTS of samples from many brands that you can qualify for based on your profile. Although they have hundreds of thousands of samples, quantities are always limited, so make sure to log in quickly. Signup and tell them a bit about yourself, your lifestyle, and what products you like. Choose what you would like to try from the menu of available samples that match your profile. They pack up your samples and send them to you absolutely free so you can try and rate them! SIGN UP FOR SAMPLE SOURCE HERE! Sample Source – “Try Before you Buy” and make a smart shopping decision! Is their moto! Get free samples of makeup, beauty care, household cleaning, even food and snacks! This site only sends out samples once a month so it’s best to sign up with them now so when sample day comes you’ll get a box of freebies in the mail. Just sign up and fill out your profile then watch your email for the notice that it’s sample day. Have you bought any milk or other dairy products since 2003? If YES you are owed $50 from a recent class action lawsuit. Read more about what the WSJ, Bloomberg & Huffington Post are saying about the case here. Tag your friends & family so they can claim their $50 as well. NOTE: To be eligible for benefits from this class action settlement, you must have purchased the milk products from a grocery store or other retailer, not directly from one of the defendants. The products must not have been purchased for resale. National Milk Producers Federation aka Cooperatives Working Together (CWT), Dairy Farmers of America Inc., Land O’Lakes Inc., Dairylea Cooperative Inc. and Agri-Mark Inc. have agreed to settle an antitrust class action lawsuit that accuses them of engaging in a conspiracy to fix milk prices. f approved, this antitrust settlement will resolve a class action lawsuit that accuses the defendants of participating in a nationwide conspiracy to limit the production of raw farm milk by slaughtering cows prematurely, causing the price of milk and other fresh milk products to increase. According to the milk antitrust class action lawsuit, the dairy farmers participating in the alleged antitrust conspiracy with CWT agreed to prematurely slaughter the dairy cows in their herds and, as of Apr. 1, 2009, they agreed not to reenter the dairy farming business for at least one year. The defendants deny the allegations but agreed to settle the fresh milk products class action lawsuit to avoid the expense and uncertainty associated with ongoing litigation. EditDid you purchase at least one Starkist Chunk Light in Water or Oil 5oz OR Solid White in Water or Oil in the United States between Feb. 19th, 2009 and Oct. 31st, 2014? If so, you qualify for up to a $25 check or $50 worth of FREE Starkist products via the StarKist Tuna Class Action Settlementn. To submit your claim, head here and complete the form no later than November 20th, 2015. You can also request that a copy of the claim form be mailed to you by calling 1-888- 643-6376. You may choose to receive either a cash refund or a voucher for free products. Click here for more information. Are you wondering what this lawsuit is about? According to the StarKist tuna class action lawsuit, which was filed in February 2013 by plaintiff Patrick Hendricks, federal law requires 5-ounce cans to contain an average of 2.84 to 3.23 ounces of tuna. However, Hendricks alleges that 5-ounce cans of StarKist tuna only contain an average of 2.81 to 3.11 ounces of tuna. 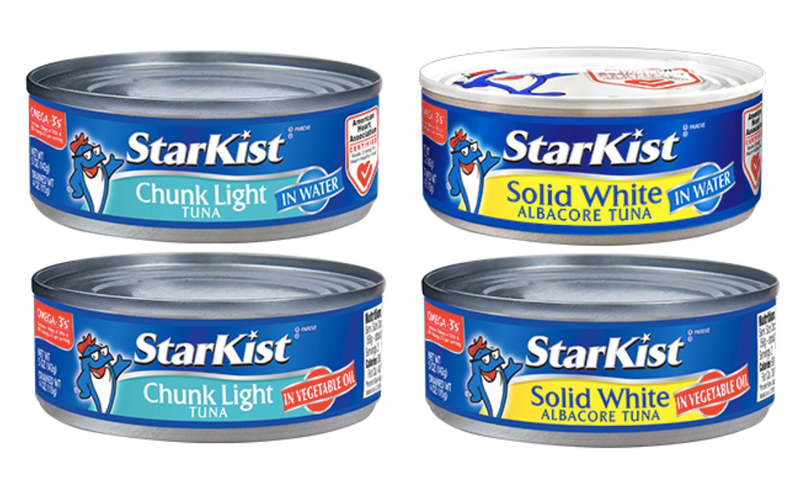 Hendricks claims he would not have purchased the StarKist tuna products if he had known they did not contain an adequate amount of tuna for a 5-ounce can. He filed the class action lawsuit on behalf of himself and a Class of consumers who purchased the allegedly under-filled cans of StarKist tuna.